This deceptively-named "Rabbinical Congress for Peace" has made a misquote from Shulchan Aruch (the Code of Jewish Law) the centerpiece of its ideology. According to them, it says that any withdrawal from Jewish territory leads to bloodshed. The actual words of the Shulchan Aruch are, "If non-Jews lay siege to Jewish cities, if they are coming to steal money, we do not violate the Sabbath, but if they are coming to kill, or if we don't know their intentions, we go out against them with weapons and violate the Sabbath. If the city is near the border, then even if they are coming to steal straw, we violate the Sabbath. And this is true even if they have not yet come, but are planning to come." Apparently these "rabbis" of RCP saw the words "Jewish cities" and the words "near the border" and thought the Shulchan Aruch was referring to a Jewish sovereign state. Nothing could be more ridiculous; the Shulchan Aruch was written about 500 years ago, and there has not been a Jewish sovereign state for about 2000 years. Moreover, the Shulchan Aruch is merely copying a law that first appears in the Talmud, Tractate Eiruvin, page 45a. After stating the law, the Talmud comments that Nehardea, a city in the Jewish section of Babylonia, is considered a city near the border. Babylonia in Talmudic times was not a Jewish sovereign state. It was ruled by the Sassanid Persian Empire. Clearly, the Talmud's intention is that if there is an attack on a predominantly Jewish area of a non-Jewish country, and the army of that country is not available to defend it, Jews are obligated to take up arms and defend their country against the marauders. A Jewish sovereign state in the Holy Land is explicitly forbidden by the Talmud in Tractate Kesubos 111. There the Talmud says that Jews are foresworn not to ascend as a group to take over the Holy Land, not to fight against the nations and not to force the end of exile. Fighting to defend a state created in violation of this law is not a mitzvah; it is a grave sin. Furthermore, the Talmud and Shulchan Aruch advocate defense against those coming to steal, not those coming to recover what was originally theirs. The gentile nations who fight the Zionists are coming to take back land stolen from them in the various wars of the past. Thus the rationale of Orach Chaim 329:6 does not apply. To take quotes from Torah sources and misapply them to a state whose very existence is forbidden by the Torah is disingenuous and misleading. 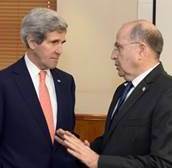 AND TO MOSHE YAALON AND OTHER ISRAELI POLITICIANS WHO SHARE HIS VIEWS WE SAY: YOUR CHUTZPAH TOWARDS AMERICA, YOUR GREATEST SUPPORTER IN THE WORLD, HAS REACHED NEW HEIGHTS. ENOUGH IS ENOUGH.